I f you lived in Southern California in the 1990s, you may have known Jay Jackson’s face for a long time. For nearly two decades, the Milwaukee native hit the pavement as a reporter, first at an African-American community newspaper, then at TV stations in San Diego and Los Angeles, his most recognizable stint being on the “death and destruction beat” at LA’s KCAL9 News. By 2005, he was well-known — and well-compensated — for his ability to interview witnesses and victims’ families with compassion. Had he continued on that path, he would have had a successful, comfortable career in broadcast journalism. But that year, he decided to put his talents to other use — and it made him a minor Hollywood legend. 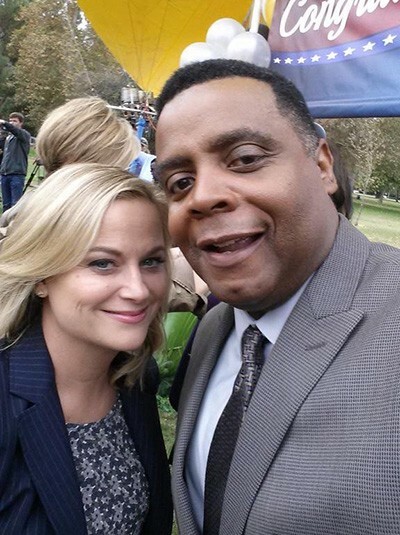 Because, let’s be honest, if anyone recognizes Jackson, it’s probably from Parks and Recreation, where he made his name as crushingly self-aware anchorman Perd Hapley. After that, he was everywhere, from Supergirl to Scandal to the Fast and Furious franchise, in nearly identical reporter roles (give or take the jokes). Over a decade, Jackson has quickly become one of the biz’s rare That One Guys — the John Munch of fictional newscasters, if you will. And it’s all because he walked away from reporting to pursue a different passion. Well, passions. It began with the Los Angeles Reporter’s Clinic, a business he founded in 2003 while still at KCAL, after a station intern offered to pay him to spend a weekend teaching her the ropes. Officially that’s what the internship’s for, but on a breaking-news schedule, there’s often no time to spare for intern training, which leaves many budding reporters without so much as a demo reel to shop. Finally, in 2005, he chose to leave his biggest job behind. But he notes that the choice wasn’t just out of the goodness of his heart: again, breaking news is an unpredictable career. For two years, he dove headfirst into his new role as mentor to the next generation of broadcast journalists (many of whom have gone on to outlets like ESPN and CNN), making his own schedule as a small-business owner while occasionally freelancing TV-news stories and also finally being able to book — and keep — his jazz gigs (including a regular night at Tuccio’s in Woodland Hills). Then, in 2007, an actor client was auditioning for reporter-type roles and needed a reel to send to casting directors. As usual, Jackson played the faux-anchor, “tossing” the camera over to the reporter in the field. In the finished clip, however, the actor’s manager saw more than a stand-in — she saw a new face with news chops. The number of journalist parts was growing, and casting directors were hungry for actors with actual reporting experience who could read (fake) news authentically. Once again, Jackson realized he couldn’t have both. So it was a solid break: he would no longer be a journalist, he’d just play one on TV. He scaled back the Clinic and threw his full weight into acting. He only ever goes out for newscaster roles, preferring the home-court advantage, and it’s paid off. And now former colleagues are asking him how to make the jump. Devon Maloney took one radio production class in journalism school before discovering broadcast news was most certainly not her strong suit. Want to hear our story? Visit us.